With a flip through Age of Blight, the new collection of short stories by Kristine Ong Muslim, one of the first things a reader notices is the images: strange, black and white photographs. One also notices that the stories are very short, most spanning fewer than ten pages. What one might not notice upon a simple flip-through is how carefully chosen each element of this book is, and how each works together to maximize the reader’s experience. Returning to the road trip analogy, Age of Blight starts close to home. One of the first stories, “The Wire Mother (or Harry’s Book of Love),” revolves around something that has already happened in our world, not after an apocalypse, though the subject matter might make you think otherwise. The story is about a series of experiments conducted by Harry F. Harlow throughout the mid-1900s, experiments which many regard as animal abuse. Moving from there, the next story focuses on Laika, the Russian space dog, who burned to death in the Sputnik-2. You will feel discomfort in these stories, but also an eerie fascination, and this fascination will carry you into the book’s subsequent sections. Then our road trip turns to more unusual territory. The stories grow more speculative in nature, from fingernails sprouting into a little boy to a zombie sister. Not only do the stories build on each other thematically, battling constantly with the good and bad of human nature and what makes us human, there is also an emotional undercurrent. While the early stories bring forth feelings of discomfort, as the collection progresses, you will continue to feel fascinated, but almost morbidly so. You begin to feel the twinges of rising hairs on the back of your neck. You begin to read faster. You might notice that your breathing is heavy, as though you are running, though you are still sitting on your couch. You are being edged closer to the apocalypse, to the bleak, inescapable landscape afterward. Many of the later stories utilize the emotional momentum that has been created by their predecessors. The final story, for example, a mere two pages, features two climbers dangling for their lives, but is nearly devoid of context. Here, it’s the feeling alone, the desperation and cruelty, that drives this piece. Age of Blight is definitely a collection to read as a whole—perhaps even in one sitting, as long as you are in a well-lit room. Some of the stories, when read separately, do not feel as satisfying. At the end of these, you may find yourself wanting more from those characters and that moment or a little more context to hold onto. However, when taken together, all these stories and the images that accompany them create the atmosphere and the world before the titular age of blight. 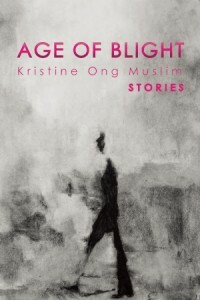 Taken as a collection, Muslim’s book is a fast and fascinating, albeit dark, read. Rebecca Davis is an MFA student in fiction at The University of North Carolina at Greensboro. She is currently completing her book-length thesis and will graduate in spring. This review is her first publication. Previous PostDo You Know Ted Cruz?